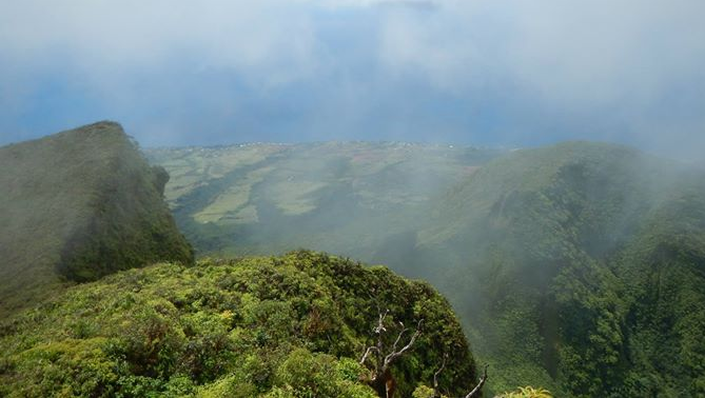 “I hiked the peak yesterday with a group of friends and based on our experience I wanted to let you know that the following no longer align with what is written in the Peak Hike description on WordPress so that others can be forewarned. 1. The cane road that use to lead into the trailhead is completely grown over and is not even capable of being driven with a full-size 4×4 SUV. We tried and got stuck. As of today, to reach the trailhead from island main road-left at pink bus stop. Continue straight until T in road. Bear right. Follow this road which turns to a dirt path into cane field. On left you will see a fence with a road adjacent to it. Make a left onto this road. Follow this road all the way to the parking area. 2. Most of the existing trailmarkers are either gone or so covered in moss and/or mold as to be invisible making many sections of the trail next to impossible to follow. Yesterday was my 4th time up the trail and I still had a hard time navigating many portions that use to be well marked. The path through the cane field is also gone leaving hikers to find there way around and back to the trail on their own with no markers what so ever. 3. The top portion of the trail near the summit is essentially gone. Almost all of it is overgrown now to the point that you have to push and fight your way through dense chest and even over your head high brush and almost all the markers are gone as well so if you don’t already know where the trail is suppose to go you would not be able to follow it at all. Without serious trail maintenance it is likely that within a few months that the top will no longer be passable. 4. Multiple ropes were also out (at least 3x) and the existing ones were in desperate need of replacement. The rope in the narrow part of the ghuat is also gone and we had a guy slip there yesterday and cut his chin open on rock. Long, steep, muddy incline to begin on roughly marked unmaintained trail. Turns into a near vertical rock scramble up wet moss covered rocks to the summit. Many ropes and exceptionally dangerous vertical drop offs. Absolutely no dogs. Disclaimer: To reach the actual trailhead by vehicle a 4×4 is an absolute must. 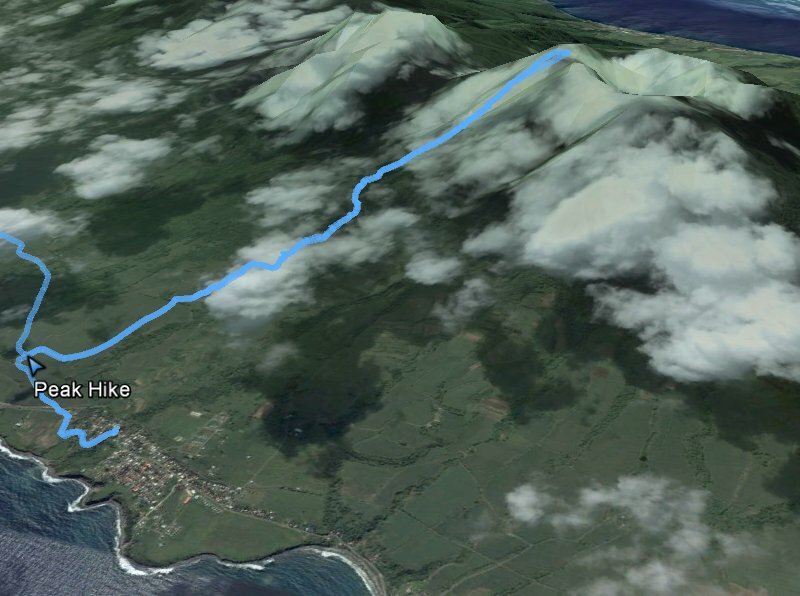 If driving to this hike with anything but a 4×4, you will be able to drive some of the cane road to the trailhead but will eventually be forced to abandon the car and finish the rest of the trek on foot. Daylight: In summer leave Ross no later than 7am. In winter leave Ross by 6:30am. You don’t want to get caught climbing down in the dark! From Ross Make a right out of the main gate passing the Medical School. At roundabout, take first exit onto Bypass. Follow the bypass down to the airport roundabout. At airport roundabout, take the second exit onto island main road. Follow island main road passing through Cayon. You will eventually come to a ‘T’ in the road. Make a right at the ‘T’ and continue to follow island main road. In about 10 minutes you will see a pink bus stop waiting area on your right. Immediately adjacent to that pink waiting area is a road make a left onto that road. At the “T” turn right, the road will begin to narrow and will eventually turn to dirt as it enters the cane field. Follow this rough cain road straight for about 500 to 1000 feet. Take the first left that you come to. Follow this cain road as it meanders its way towards the mountain. 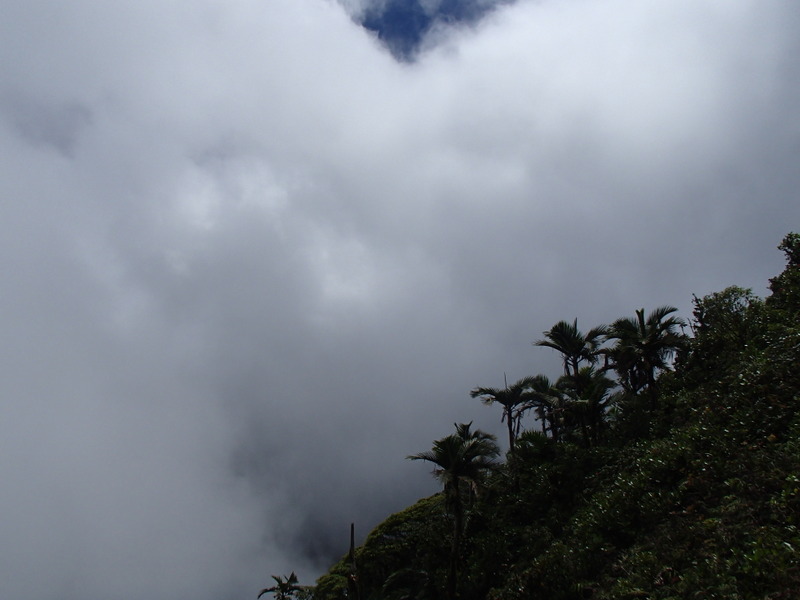 You will eventually leave the cane field behind and drive into the foothills of the mountain. Once in the woods, proceed about another 500 or so feet, the road will dead end there, this is where you park. The trail begins to the right of the parking area following a series of yellow and pink blazes. Be sure to watch them intently as they are hard to see and there is no path on the ground to follow so it is exceptionally easy to get off the route. The first 2000 or so feet of the trail involves a slight uphill ascent through a wooded area. Eventually, up ahead on your left, you will see a cane field, you will notice a blaze on a tree on the border of the cane field. This blaze marks where you have to cut through the cane field. Follow the rough narrow path through the cane field exiting on the other side. From here the first third of the hike steadily becomes more steep, slippery, and rugged (about a 20 percent grade) as you traverse the ridge of the rise separating the two river gouts. At points, the ridge will narrow to just several feet wide with long steep cliff dropoffs on both sides. At one point you will have to cross a section roughly 20 feet long that is no more than 2 feet wide and flanked by cliffs on both sides and as of this writing has no rope so it is a balancing act. The second third of the hike begins once you reach the creekbed and ends when you reach the long, near one hundred foot rope section. This section involves a steep ascent of the river gaut followed by a muddy scramble up slick rocks through the jungle. The beginning of the section is about a 20 percent grade but that grade will steadily increase to near 40% grade before you make it to the rope. 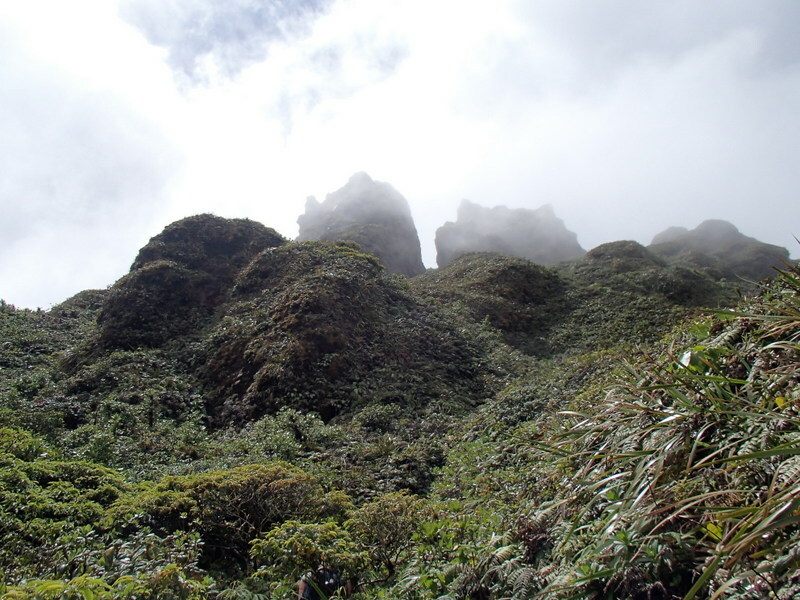 The last third of the hike is a near vertical ascent (above 60% grade) up the rocky peak to the summit. Though short, ? of a mile, you will gain just under 1000 feet of elevation. There are many ropes and slippery near vertical sections to traverse. 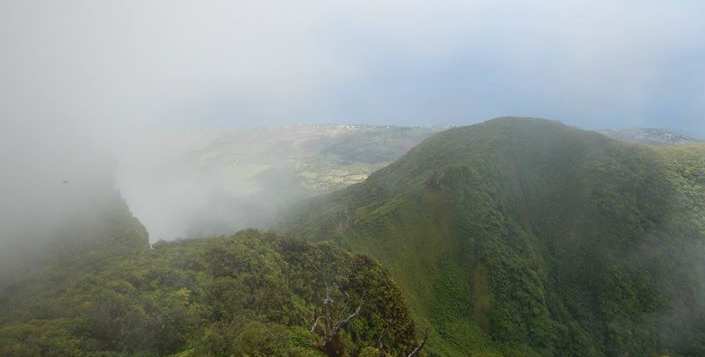 Near the top there is also a death defying section as the trail loops around to the crater side of the mountain leaving you with nothing but plants to cling to as you stare hundreds of feet down into the crater. Then up one last rope and you will emerge on the summit. You will know that you have reached the end of the trail when you see a black mailbox. On a clear day you will get one of the best views in this region of the world. Expect to see eight islands. On a cloudy day, all you will see is clouds. Note: most phone and tablet GPS’s have difficulty accurate fixes in this region. Recommend using a true hikers handheld GPS unit. Is the trail still overgrown? 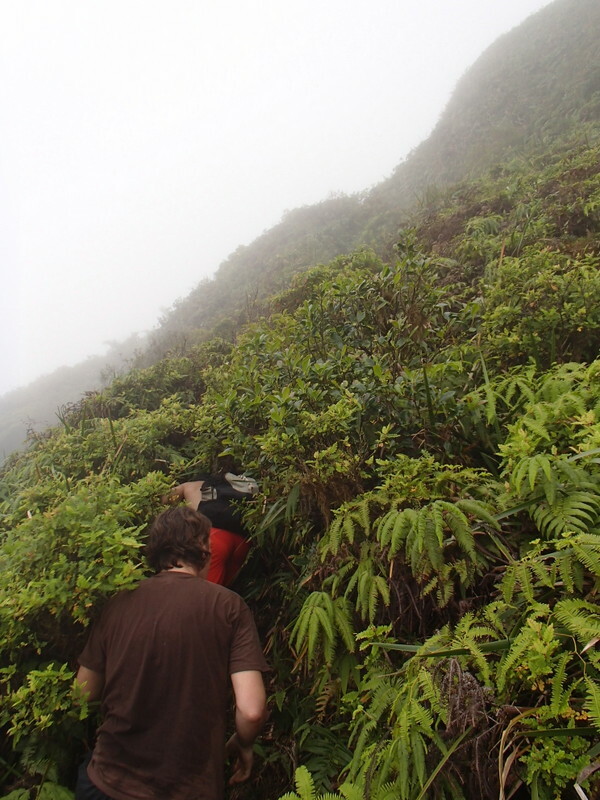 It looks like the crater rim hike from the west side of the island is a well worn trail that could be done without a guide. Is that accurate? 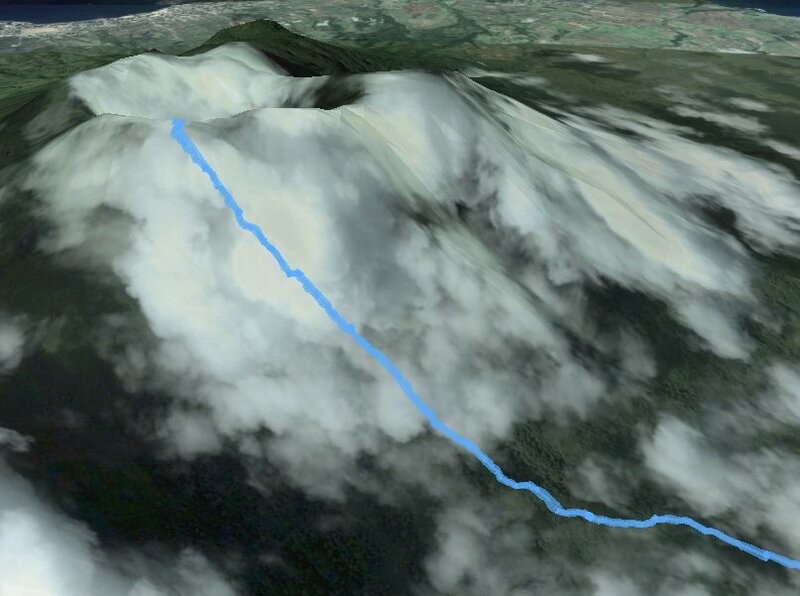 I’ll be there next week and wanted to summit mt liamuiga but if the trail is a bush whack I’ll opt for the other trail.